Now you can use our Laser Blox™ to take the building block experience to a whole new level. Our state of the art laser engraving system allows us to personalize your child's name on the bottom of every block in your set. Laser engraving is available for both individual blocks or building block sets. You can specify the name, font and location for engraving. The bottom surface of each building block you order will be engraved per your instructions. Makes it easy to sort out blocks after a play date. Also perfect for day care centers or kindergartens to mark their blocks for easy identification. Available for all individual blocks and all block gift sets. 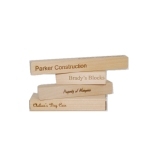 Expand one of our Laser Blox™ Laser Engraved building block sets or build your own custom wood toy building block set. 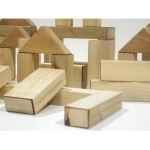 Packages of individual toy building blocks in a variety of shapes and sizes personalized by laser engraver. Laser Blox Sets combine our natural wood building blocks with state of the art laser engraving to form a uniquely personalized wood block. Kits range from starter sets up to mega sized sets suitable for families up to day care centers.